First of all, I would like to let you know that I am not going to summarise the storyline of Ergo Proxy. Why? Because there is no such. This is one of these anime that makes you envision and arrange the plot line yourself to the point that you’re not sure what you have seen and what you have invented. Still, what we know is that we’re situated in the future (year 7207) where people live in a “Dome City” named Romdeau, accompanied by androids called AutoReivs who are separated by types – Entourage (the owner’s PA); Knight (a fighter) and a Companion (ditto). One day, a mystery virus affects some of these machines by giving them free will and feelings, causing strange behaviour. This is when we meet young Re-I Mayer, granddaughter of The Regent of Romdeau and a Citizen Information Bureau inspector who wants to get to the bottom of the Cogito Virus incidents. Of course, that is only the tip of the iceberg. In fact, the complete story of this anime (if told straight) is too simple and reminiscent of any classic Sci-Fi movie ever made. In short: people make a mess out of Earth (by overusing methane as energy source hence causing series of powerful venomous explosions), then split it into small regions (Dome Cities) ignorant of each other’s existence and create artificial beings (Proxies) to maintain the life that’s left before running away (on the specially-made Boomerang Star). Of course things don’t happen as expected, as the creatures are not ready to serve uncomplainingly, handle all weight of the responsibility and self-destruct, when needed (through the Amrita Cells forming their bodies that are destroyed by real sunlight). As the “healing” of the planet has taken too long and humanity would’ve perished otherwise, the “new people” are born on Earth through the artificial WombSys (rooms full of partitions, each containing an AutoReiv carrying a human foetus in its womb). Striving for answers and not quite having the same purpose as her ancestors, Re-l Mayer is the best representative of humankind 5000 years after the disaster. “The Pulse of the Awakening” pounds in every Proxy’s chest to announce it’s time, so are Re-l and her friends Vincent Law and Pino ready to face the returning humankind? In the beginning, there were 300 Proxies but those we meet in the anime are no more than eleven. Each of them is a keeper and somewhat “a God” of a Dome City that cannot exist without the Proxy’s power. 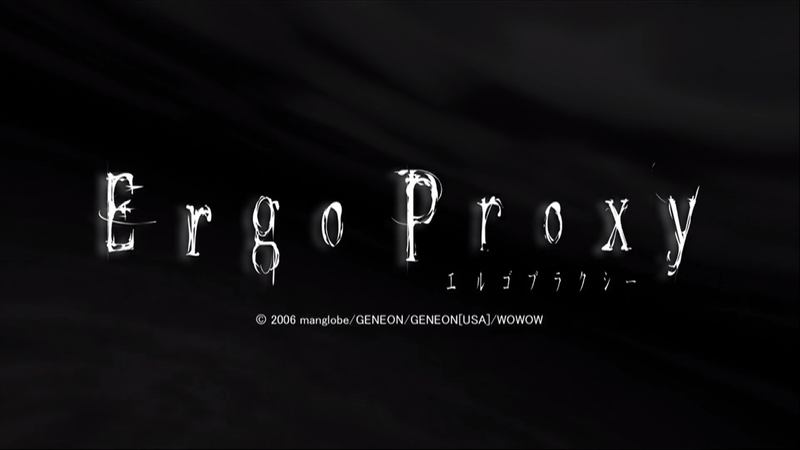 As far-fetched as this may seem, according to the creators, the name “proxy” comes from the Latin phrase “genus proximus” meaning “nearest species”. Vincent Law which actually may be translated as “prevailing/conquering law” is an immigrant in Romdeau. When you meet him, you are ready to vote him as “the first guy to die”. Kudos for the anime creators, as (BIG spoiler ahead!) in fact he is not only the lead character of the anime but also the alter ego of Proxy One (creator and guardian of Romdeau) known as Ergo Proxy – the Agent of Death. He has no recollection of his true nature and is only beginning to grasp what’s ahead. Since the beginning of the series, Vincent has a strange fixation for the Citizen Information Bureau inspector Re-l Mayer. Her name actually derives from the word “real” without the “a” and is pronounced as “Riru”. Her surname Mayer has a Latin origin and means “bright/shining”. Later on, we also realise the reason for Vince’s mania, as she (as well as few more clones) is in fact the product of Romdeau science, being produced by genetic material from Mosk city’s Proxy – Monad (meaning “a basic impenetrable element” according to Philosophical theories, she is also the Agent of Life). She, on the other hand, has sacrificed her mind to help her loved one Ergo achieve his goal – forget everything and become (somewhat) human. The other main character of the series is the cute Companion-type AutoReiv girl named Pino. She is called so as a reference to Pinocchio who, just as Pino herself, dreams of becoming “real”. According to internet sources, Pino is also a reverence to Pinoko – a character from the anime Black Jack. Yumeno Daedalus, freely translated as “The Dream of Daedalus” is the mastermind behind everything that happens on Earth. Just like the Greek Daedalus, Yumeno is undoubtedly this universe’s most skilful creator and innovator. He’s not only Chief physician of the Proxy Research Team and Director of the Division of Health and Welfare in Romdeau but also one of the very few who have seen the full picture of what Earth actually is. One-sidedly in love with Real – the prototype human/Proxy hybrid he created himself, Daedalus is also the man behind the only weapon that can kill a Proxy – FP rays replicating the Sun’s UV rays. The animation and character design are by Naoyuki Onda, already known for his work on Ganz, Witch Hunter Robin and Wolf’s Rain. He’s accompanied by chief animation director Hideto Komori (Fullmetal Alchemist, Samurai Champloo, Evengelion, Blood +)… The script is made by Dai Sato (Ghost in the Shell, Cowboy Bebop, Terra e…, Eureka Seven). Amongst that much brilliance, would the sun shine on Ergo Proxy…? Unfortunately, there are two polar surfaces in Ergo Proxy – the character and landscape design that are absolutely stunning and the actual animation that provides endless deformed shots, even of a facial close-up. Personally, I was amazed at seeing how, when in background, every character becomes an amoeba-like substance with no details. In addition, a few sequences of flying ships like “Centzon Totochtin” (“400 Rabbits”, taken from the Aztec mythology) on a dark futuristic landscape reminded me more of an old RPG game than of an anime. The first meeting eye-to-eye between Re-L and Ergo. What does “awakening” written on her bathroom mirror mean? Having said that, as the series feature a combination of 2D traditional animation, 3D computer modelling and digital special effects and was completed in 2006, I may assume that this “mixture” was a bit too innovative and ambitious for its time; hence, becoming the reason for some of the visual misfortunes. If you give me a second chance, I would still watch it because of the brilliantly imaginative character design and the abundance of darkness some of the landscapes and city lines manage to recreate. I would also call it visually enchanting, in spite of the numerous animation fails. At the end, Monad Proxy (The Agent of Life) flew towards the Sun to symbolically meet her end, while Ergo Proxy (The Agent of Death) remained waiting for humankind’s return, probably watching over the completion of his only task – making sure every unneeded existence would perish now, when the “rightful owners” of the Earth return. Matter-of-factly, nothing of the above is told straightforwardly anywhere in the anime, so please make sure to not take my opinion as absolute. I cannot be sure who is who and why Ergo (the Agent of Death) remained alive long after the Sun has shone. I do not know who Re-l Mayer actually is and which Monad died at the end. I struggle to understand the depth of the Proxies’ endless clones and transformations. I fail to grasp the idea of them constantly fighting and hurting each other… Maybe they’re just like humankind – imperfect and constantly changing to the point of becoming eternal…or maybe I am overthinking it. Lost between the feeling of being cheated to watch something that only revealed through a long speech in the last episodes and the torturing hesitation that this may in fact be a brilliant and bold approach by the creators, I have come to a conclusion – to each his own. I watched this back in 2008 during a severe head cold, high on cold medicine. I never fully understood the whole spectrum, but I really appreciate your analysis of this. Thanks so much, it’s one of my favourite anime, but I could never put my finger on why. This interpretation was easy-ish to digest. I look back on it as one of the best if not THE best anime I have ever watched. On behalf of my Death Scythe, I thank you for stopping by to comment and write your feedback for this review! I haven’t seen it but people recommended it as a good Sci-Fi. The story seems cool enough. “?rgo Proxy” – one of the reasons for internet conformism. Just dare to say it has no plot or character development. I have literally seen people being branded idiots by several anime/manga forum “societies”. I still think it’s overrated and is a classic example of “The Emperor’s New Clothes”. Of course, the reviewer was too scared to say so. Again. OMG! I love this show!!! You should’ve watched it several times to get the things you haven’t understood, though. It didn’t make sense to me as well when I first watched it. I even kind of hated it, but after a rewatch and a tri-watch, I started to love it. I believe this is one of the best anime ever made. Re-l is also amongst my absolute female favourites (together with Clare from “Claymore” and Erza from “Fairy Tail”). I agree with you! I am a great fan and still haven’t considered some of the name meanings mentioned here. I am also sure that this hasn’t been made anywhere up to now. Kudos to the reviewer.